Whether you’re vegan or lactose intolerant, you can still get your chocolate fix! With the rise in different dietary requirements and preferences, dairy-free chocolate is now available, and it’s the real deal. 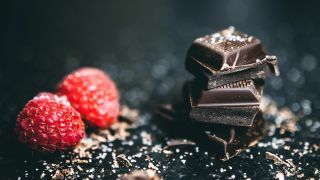 Here, we’ve rounded up some of the best brands on the market offering delicious dairy-free chocolate for all to enjoy. Although you can buy chocolate that states it is free from milk or milk powder, this doesn’t necessarily mean it is free from other animal products. If it was made in a factory where there are traces of dairy, it can still have an effect on those with a severe lactose intolerance. If you want to make sure there are absolutely no traces of dairy in your sweet treats, Booja-Booja’s Organic Hazelnut Chocolate Truffles are made in a dairy-free factory. Look out for the Vegan Society logo or a vegan-friendly label to ensure your chocolate is suitable for consumption. We’ve picked out some of the tastiest dairy-free chocolate on the market right now, so take your pick and indulge yourself. These luxurious truffles from Booja Booja are completely vegan and dairy-free, made in a factory that has the Vegan Society’s stamp of approval. They have a hazelnut flavour and creamy texture with praline pieces which gives you all the pleasure of regular milk chocolate. They are made from organically grown ingredients, using coconut oil in place of milk powder to achieve their soft, indulgent centre. Samplers say they are very rich so you only need a small amount to satisfy your chocolate cravings! This Moo organic milk chocolate is free from pretty much all allergens except nuts, making it suitable not only for vegans and lactose intolerants but coeliac too. Those who have tried it are very impressed with the taste, saying it is very similar to milk chocolate and is the closest in taste you can buy when it comes to dairy-free chocolate. You may prefer Moo over Booja Booja’s truffles if you’re not a massive fan of dark chocolate. If you like dark chocolate but find that it is just a little too bitter sometimes, then this vanilla flavoured chocolate should give you the balance of sweetness you need. This dairy-free chocolate bar also has a kick of maca root which makes this a unique tasting chocolate- great for those who like to experiment with exotic foods. Healthier than your average chocolate bar, you’ll be able to snack on this guilt-free whenever you need a little pick me up. Mint chocolate is great for refreshing the palate after dinner, and now Pana have introduced this dairy-free option, everyone can get their fix. It is made from raw cacao and pure peppermint oil which not only gives it a kick, but is designed to boost energy levels, too. It’s also free from soy and gluten and doesn’t contain any refined sugars, so you won’t get that sugar crash halfway through the day if you fancy a sweet treat for elevensies. Dairy-free chocolate doesn’t have to be plain and simple. This raspberry and coconut chocolate bar is loved by many for its creamy texture that a lot of vegan chocolate doesn’t have. The bitterness of the dark chocolate is complemented by a sweet raspberry kick and refreshing coconut aftertaste. It’s not everyone's favourite, but if you want something a little different, then this a great one to try. Dark chocolate with sea salt is a popular combo, and now this dairy-free alternative means vegans can enjoy it, too. Be warned, this bar does say it may contain traces of nuts and milk, so those with severe lactose intolerance may want to steer clear of this one, but it does have a vegan stamp of approval. This bar is made up of 75% cocoa, blended with smoked sea salt from Cornwall’s Grade A classified waters. This chocolate is ideal for cooking with, as users say it doesn’t taste too bitter like a lot of dairy-free chocolate bars often do. It’s still not as sweet as regular chocolate, but when blended into cakes and other treats it is difficult to taste the difference. You can also purchase this chocolate not only in dark, milk or white, but a range of flavours, too. If you’re looking for variety then Vivani is the chocolate for you.